Symptoms and indications: Pain, swelling, and skin discoloration. The bruise begins as a pinkish, red color that can be very tender to touch. It is often difficult to use the muscle that has been bruised. Causes and risk factors: Bruises can happen for a lot of reasons, but are mostly the result of bumping and banging into things - or having things bump and bang into you. Sometimes, unexplained bruising can be a clue that a person's blood vessel walls are brittle or that a child has insufficient blood-clotting factors. 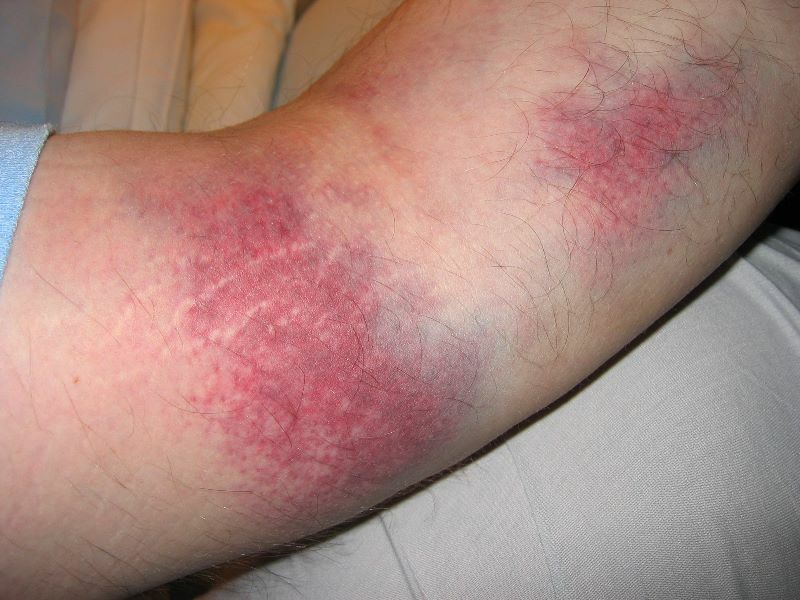 Bruising can also signal the onset of serious illnesses such as leukemia or haemophilia. Prevention: Because bruises are usually the direct result of an injury, the following are important safety recommendations: Teach children how to be safe. Be mindful to avoid falls around the house. For example, be careful when climbing on ladders or other objects. Avoid standing or kneeling on counter-tops. Wear seat belts in motor vehicles. Wear proper sports equipment to pad those areas most frequently bruised (thigh pads, hip guards, and elbow pads in football and hockey; shin guards and knee pads in soccer and basketball). Reduce or eliminate sugars, as they interrupt the healing of tissue. Avoid saturated, hydrogenated, and trans-fatty acids found in meat and packaged processed foods, as there interfere with the healing of cells. Dark-green leafy vegetables provide many minerals that help heal bruising, such as vitamin C and vitamin K. Citrus fruits, bell peppers, and other brightly coloured vegetables and fruits provide bioflavonoids that help heal bruises. Fish such as salmon, nuts like walnuts, and seeds such as flaxseeds provide essential fatty acids that are necessary for tissue repair.